Many of my in-laws went on a hike on Tuesday. It was quite a hike, apparently I went more than 2/3rds up the red rock bluffs. Then, that was it. It was over a mile in distance, it felt as high as that photo shows. Maybe 15 stories or so, but that’s just a guess. Most of the family went the full distance, My calves hate me, but they’re in for more of a treat when I (finally!) get my bike. I think my knees are alright. They’re looking forward to less weight pressing down on them. Joe Crawford blogged this at 12:15pm in 2006 in December. The 29th was a Friday. You are reading this 12 years later. Comment. There are 2 comments Tweet. Send email. It has hashtags→ kanab photos utah . Wow! 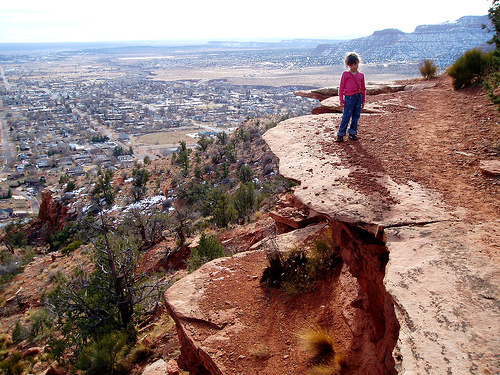 What a great picture of Kanab in winter, one of my favorite vacation spots. The girl in the pic really gives scale to the composition. Nice job. Makes me want to return for a visit.